In my view the basketball players are all very tall. In my opinion, I found that this sport is very physical and I like very well. From my point of view, these players are very good because they reached lots of points. 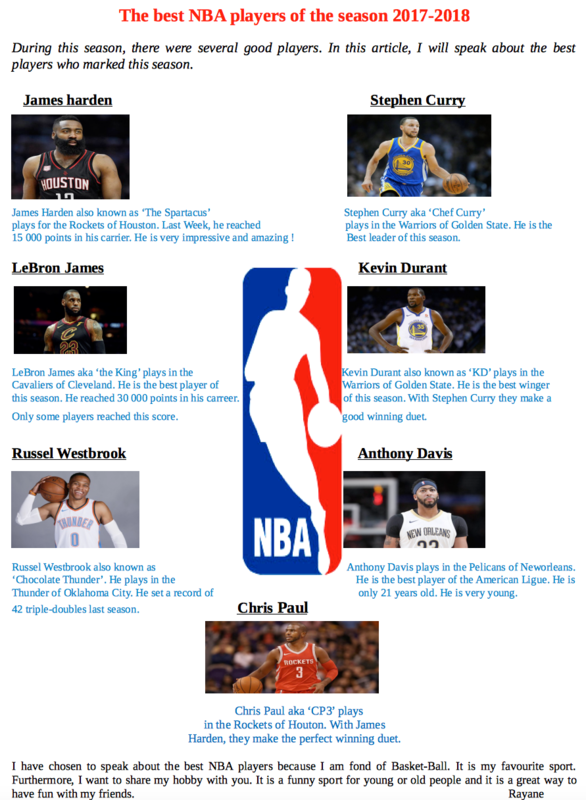 I a gree that, james harden, stephen curry, lebron james, kevin durant, russel westbrook, anthony davis, chris paul, are the best player of the season 2017,2018. in my view this is best artical. If you ask me, I think Lebron James is the only best player of the NBA. I believe that this article is constructive and basket-ball is a good sport. In my opinion, I think this article is very good beacause it made me discover other players that I did not know. I agree because it's interesting . To be honest, I don't like basketball and it's good for this basketball players if they are the best. To be honest, I not looked the basket-ball on the TV,or I like play that. I believe the basket-ball is a very interesting sport but I don't realy like it. I know a lot of people who could like this article.